Bromley return to National League action at Hayes Lane on Saturday afternoon when they entertain Maidstone United in a Kent Derby. The Ravens go into the match sitting in twelfth place with 41 points from 32 games having drawn away to Barrow 1-1 last weekend, The Ravens equaliser coming in the second half from JJ Hooper. With two draws and one defeat from their last three games and having lost Adam Mekki to a broken leg and Zavon Hines to injury enforced retirement, manager Neil Smith brought in three players on short term deals last Friday. Winger Brendan Sarpong-Wiradu joined on loan from Charlton, ex-Millwall striker Jamie Philpott signed and wide man Dennon Lewis was recruited from Scottish Championship side Falkirk, all three featured in the game at Holker Street. Maidstone make the journey across West Kent on the back of a good 3-0 win over Salford City in the FA Trophy on Tuesday night. New manager John Still has over seen a re-haul of the playing squad as The Stones look to edge away from the relegation zone and build for the future. They currently sit 23rd in the table with 26 points from 32 matches. Unbeaten in three games, Maidstone are still seven points from safety, so a win is looking to be essential for their hopes of survival. When the two sides met at The Gallagher Stadium in October, Bromley ran out 1-0 winners thanks to an early goal from Junior Ogedi-Uzokwe. Since both sides have been in the National League, The Ravens have had the better of things in these matches recording two league doubles, but Still has already managed a team to victory at Hayes Lane this season when his former side Barnet won 1-0 there in September. A good crowd is expected at The Lane for this Kent Derby between two old rivals both looking to get a good run of results together as we enter the last quarter of the season. 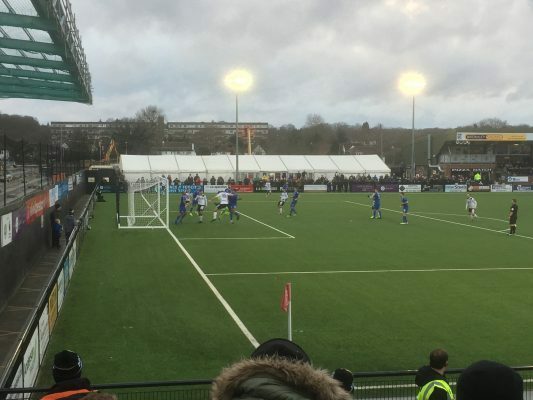 This entry was posted	on Thursday, February 14th, 2019 at 9:00 am	and is filed under Featured, Football, Non-League Football. You can follow any responses to this entry through the RSS 2.0 feed. Both comments and pings are currently closed.